Are you looking for a class that will improve your posture, coordination, strength, balance and flexibility whilst also giving you the chance to move to beautiful music and get to know new people? Why not come and try one of our adult ballet and body conditioning classes. These classes are for those who are completely new to dance, who have danced in the past or are still dancing now. 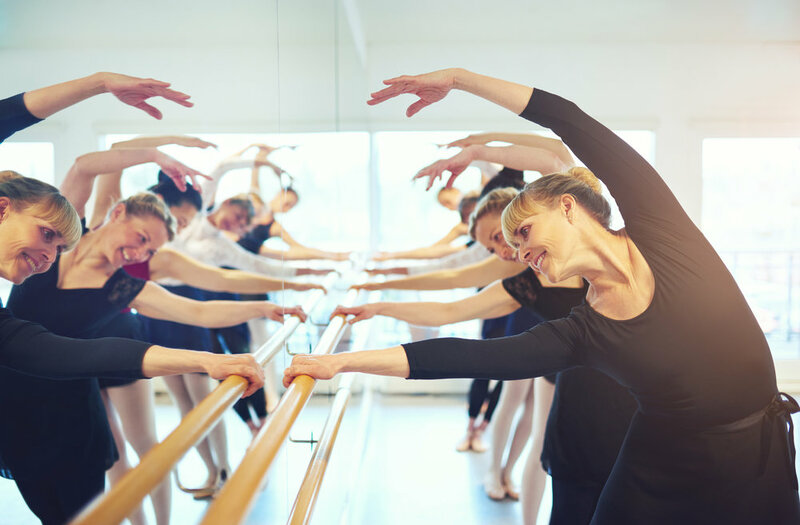 We combine traditional sections of a ballet class such as barre work, adage, turns and jumps with pilates and yoga exercises to build body awareness and develop good technique. Exercises are adapted for different abilities which means everyone can join in to a level that suits them. We are also very proud to be a Silver Swans Licensed teacher which means we have been trained by the Royal Academy of Dance to deliver classes specially designed for older learners that will help improve your mobility, posture, co-ordination and energy levels. Classes are £8, pay as you go. Click below to book or contact us for more information - info@thedancebarn.co.uk or call 01993 220 413. I have not done ballet before. am I still able to do this class? Absolutely! Classes are planned for beginners, improvers and more advanced options given for those who do a lot of dance or who are returning to dance after a break. What should I wear? Do I need ballet shoes? Dance or gym wear is fine. You can do the class in bare feet or socks but ballet or jazz shoes are advised to enable you to use your feet with the dexterity required of the dance style. I have had an injury and I am not sure if it will affect my ability to take part? When you book you will be sent a link to an online health questionnaire so that the teacher can be informed of any medical conditions or injuries that may affect your participation. We can then plan accordingly and may contact you if we have any questions. If you are unsure please contact us to discuss further or speak with your GP. Simply click on the button in the middle of this page and book as many classes as you want! If you have paid for a class but you are not longer able to attend please let us know by 6.00pm the day before and we will be able to issue a refund. Refunds will not be issued after this time. If we have not answered your question here please do not hesitate to get in touch - info@thedancebarn.co.uk.